Approximately 10% of newborns are born too soon, and about 1% of newborns are born before the 32nd week of pregnancy. These preterm infants have a high risk of developmental disorders, severe mental and physical disabilities, attention deficit disorders and learning difficulties. Former preterm infants are also highly vulnerable to later health problems such as an increased susceptibility to infection. Babies born at term may also develop health problems before and during birth (e.g. stroke, oxygen deficit) with lifelong consequences. The situation is an enormous challenge for the children concerned and for their parents on a physical, emotional, and also on a financial scale. There is a need for effective organization, assistance and support for the children and their families. Doctors and scientists are faced with a dilemma in that improvements in intensive care have reduced neonatal mortality, but there has been no concomitant reduction in consequential problems such as neurological disorders. There is an urgent need for new approaches to improve neonatological intensive care and develop new diagnostic and therapeutic measures to protect and promote the brain. Researchers and neonatologists must contend with the lack of a lobby for children in society as a whole, and for newborns in particular. The medical care invested for one additional year of life for a newborn is a mere fraction of the corresponding sum for an adult. At 10%, preterm births account for a large share of total births. More than half of the population of preterm infants with a very low birth weight have various forms of disability. Nevertheless, this issue is barely reflected in national and private (pharmaceutical industry) research funding, compared with the amounts spent on the “major diseases of civilization” such as high blood pressure and heart attack in adults. Public interest in the care of neonates and preterm infants also pales in comparison with the attention devoted to childhood cancer (with an incidence of 1:25000 of all cancers versus 1:100 for extreme preterm births). There is a need for targeted lobbying for newborns and support for experimental and clinical research, the establishment of quality standards and training opportunities for medical professionals to improve neonatal care, prevent preterm births, and support the parents and children concerned. This Foundation has been initiated by parents’ associations, scientists and the founders. 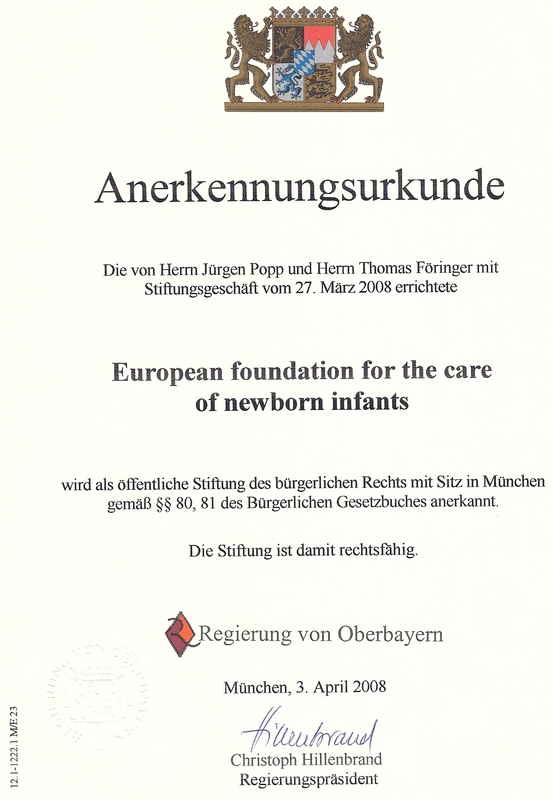 The Foundation is called “European foundation for the Care of Newborn Infants (EFCNI).” It is a civil-law public foundation having legal capacity, with its headquarters in Munich, Germany. 2. to promote the research and performance of measures intended to prevent or avoid preterm birth. by promoting the improvement of the community care of premature or sick children after discharge from hospital. These measures will be completed successively and depending on the resources available. (3) Hence, the Foundation is exclusively and immediately devoted to charitable purposes as defined in the “tax-relieved purposes” section of the fiscal code. (4) The Foundation may provide other tax-relieved bodies, institutions and foundations or a suitable public authority with financial or material resources provided those agencies use these resources to promote the measures pursuant to section 2. (1) The Foundation is altruistic. It is not primarily devoted to securing its own economic viability. It may not benefit legal or natural persons with disbursements that are not in line with the purpose of the Foundation or provide them with unusually high funding, bestowals or remunerations. (2) Beneficiaries of the Foundation have no legal entitlement to benefits from the Foundation on the basis of this Charter. (1) The endowment property shall be maintained on a permanent basis and shall not be diminished. It amounts to €50 000 in cash. (2) Contributions to the Foundation (additions to the endowment property) are allowed. Contributions with no stated purpose on the basis of a last will and testament may be added to the endowment property. 2. from bestowals, provided they are not stated by the donors as being for the purpose of adding to the endowment property; § 4 (2) (2) applies notwithstanding. (2) All resources may be used only for purposes in accordance with this Charter. (3) Reserves may be accumulated if and for as long as required in order to meet the tax-relieved purposes under this Charter, and provided that specific purposes and times exist for the use of the reserves. Surplus revenues exceeding administrative expenses may go to maintain the value of the endowment property in accordance with fiscal terms and provisions. 2. the Board of Trustees. The activity of the Foundation’s organs shall be honorary. Any expenses incurred shall be reimbursed. The Board of Trustees may determine an appropriate lump sum to cover the material and time expended by the members of the Executive Board of the Foundation. To secure fulfillment of the purpose of the Foundation in day to day operations, the Board of Trustees may vote to appoint a member of the Executive Board or a Secretary to work full-time. In either case, the Board of Trustees shall determine a suitable fee which shall expressly not be paid out of the revenues from the endowment property but from other sources (e.g. sponsoring agreements). (1) The Executive Board of the Foundation is composed of three members with a term of office of four years. These shall initially be appointed by the founders when the Foundation is set up, thereafter appointed for a period of four years by the Board of Trustees. a person freely elected by the Board of Trustees. Any exceptions to the above shall be approved unanimously by the Board of Trustees. If an Executive Board member leaves before the end of a term of office, the new member shall be appointed only for the remainder of the term of office. Re-appointment is allowed. A person leaving the Executive Board shall remain in office – at the Board of Trustees’ request – until a successor has been appointed. (2) The Executive Board shall appoint one of its members to be a Chairperson and one to be a deputy chairperson who shall represent the Chairperson in all matters in the Chairperson’s absence. (1) The Executive Board of the Foundation represents the Foundation before the courts and out of court. The Executive Board has the powers of legal representative. Two members of the Executive Board of the Foundation shall represent the Foundation jointly in such cases. (2) The Executive Board of the Foundation is empowered in lieu of the Board of Trustees to issue urgent directives and conduct business transactions that brook no delay, provided relevant feedback is not obtained from the Board of Trustees within 24 hours of launching a written circular voting procedure. The Executive Board shall notify the Board of Trustees no later than at the next meeting. to compile a report on fulfillment of the Foundation purpose and to give an account of the revenues and outgoings of the Foundation and of its assets (§ 9 subs. 1 clause 2). (4) The terms of §12 of this Charter apply mutatis mutandis for the conduct of business by the Executive Board. (1) The Executive Board of the Foundation shall keep records and collect receipts pertaining to the revenues and outgoings of the Foundation. A report on fulfillment of the purpose of the Foundation and accounts of revenues and expenditure and of the endowment property shall be drawn up at the end of each fiscal year. (2) The Executive Board of the Foundation shall have the Foundation audited by an auditor or other agency authorized to issue an equivalent confirmation in the event of the endowment property. The audit must extend to the preservation of the endowment property and the use in accordance with this Charter of the Foundation’s revenues and any monies donated for intended use. The fiscal year is the calendar year. The year of establishment of the Foundation is hence a short fiscal year, ending on December 31, 2008. (1) The Board of Trustees has five members. These are appointed for an initial term of five years by the founders upon establishment of the Foundation. Thereafter, the Board of Trustees shall extend its number by electing further members with a period of office of five years. If a member leaves before the end of the appointed term, the replacement member will be elected only for the remainder of the period of office. Re-election is allowed. A person leaving the Board shall remain in office – at the Board of Trustees’ request – until the replacement has been elected. (2) No more than two members of the Board of Trustees may be members of the Executive Board of the Foundation at the same time. (3) The Board of Trustees shall elect from among its number a chairperson and a deputy chairperson who represents the Chairperson in all matters in the latter’s absence. modifications of the Foundation charter and applications for conversion or dissolution of the Foundation. (2) The Chairperson of the Board of Trustees represents the Foundation in legal transactions with the Executive Board of the Foundation or individual members of the Executive Board. (1) The Board of Trustees shall be convened by the Chairperson as needed, but at least once a year, giving the agenda and 8 weeks’ notice prior to a scheduled meeting. Meetings shall also be convened if 2 members or the Executive Board so demand/s. The entire Executive Board may attend Board of Trustee meetings, and is obliged to do so at the Board of Trustees’ demand. (2) The Board of Trustees has a quorum if the meeting was properly convened and more than half the members, including the Chairperson or deputy chairperson, are present or, with the chairperson or deputy chairperson present, at least one third party is connected for the duration of the meeting and in full knowledge of all documents on the agenda by telecommunications media (e.g. telephone). Summoning errors are considered remedied if all the members concerned are present and none of them object. (3) The Board of Trustees makes all decision unless a case according to § 13 applies – with a – simple – majority of the votes issued. In the event of a tie, the chairperson or the deputy chairperson has the casting vote. (4) If no members object, resolutions may be done in a written circular voting procedure. The written form is fulfilled by telex, fax, email, or other documentable transfer of vote in electronic form. This does not apply to decisions under § 13 of this Charter. (5) Records must be kept of the results of meetings and resolutions in circular voting procedures and signed by the Chairperson and or Secretary. They must be drawn to the attention of all members of Foundation organs. (1) Amendments to the charter are allowed provided they seem necessary as a means of adapting to changing circumstances. They must not impair or cancel the Foundation’s tax relief status. If they might have implications for the Foundation’s tax-relief status, they must be submitted to the competent financial authority for comment. (2) Amendments of the purpose of the Foundation are allowed only if its fulfillment becomes impossible or circumstances change to the extent where fulfillment of the purpose of the Foundation no longer seems apposite. Conversion and dissolution of the Foundation shall be in accordance with legal requirements. (3) Resolutions pursuant to paragraph 1 above require the consent of 4 members of the Board of Trustees. Resolutions pursuant to paragraph 2 above require the consent of all members of the Board of Trustees. The resolutions come into effect only after approval by the Government (§ 15). In the event of dissolution of the Foundation or cessation of its tax-relieved purposes, the remaining property shall fall to charitable foundations or organizations chosen by the majority of the incumbent Board of Trustees. These foundations/organizations shall use it directly and exclusively for pro bono publico / charitable / pro bono publico and charitable purposes, in line with the purpose of the Foundation. (1) The Foundation is subject to the supervision of the Upper Bavarian Government. (2) The supervisory authority for the Foundation shall be informed without delay of any changes in address, representation authorization, and constitution of the organs. The Charter enters into force upon recognition of the Foundation by the Government of Upper Bavaria (Germany). You can download the certificate confirming that EFCNI is a non-profit organisation by German public law here. The valuable and serious work of patient groups and the service they provide needs to be recognised, valued and supported. However, most groups are struggling to find sufficient, diversified resources, to fulfil their mission and objectives likewise remain independent, whether funding comes from corporate or public sources. Patient organisations are targeting to work constructively together with all stakeholders to ensure that the credibility of patient groups is safeguarded. For this reason, patient organisations (see list below) have developed the following transparent and robust Code of Good Practice to guide the relations between patient organisations and the industry (including their representatives and consultants). We encourage all patient organisations to adopt this code when engaging in a dialogue, working partnership, joint initiative, and/or when accepting support from any funding source. This code aims at defining a set of basic principles and recommendations. We fully appreciate and support that European healthcare systems stand for social equity and solidarity. We maintain that access to limited resources is governed by principles of equality. In a democratic society, patient organisations play an increasingly important role. Their work is extremely varied depending on local needs, but generally can be divided into two broad categories: firstly, raising awareness and advocacy about diseases and health policy issues and secondly how to best maintain health providing support for patients, their families and carers, building capacity within their membership, setting up self help/support groups and sensitising society to equitable sharing of healthcare. Our governments in Europe are committed to protecting the health of their citizens based on social solidarity, irrespective of age, race, gender, domicile and socio-economic status. This is intended to guarantee equality in healthcare and to support the laudable goal of “health for all”. Demographic change, ageing societies and a growing range of medical high-tech treatments existing, will confront our society with difficult decisions on how finite resources are fairly allocated within healthcare systems and budgets. Patient organisations along with other stakeholders need to be involved in those debates to ensure that policy decisions and actions are fully transparent and adopted in a consensual manner. Many interests and stakeholders interact in our health systems. Patient organisations have the role to warrant that the patients’ voice is heard at all levels of decision making, monitoring the implementation of policies and actions that concern health and healthcare and that the existing system achieves the best outcome for our society. Patient organisations take an interest in interacting and communicating with these different stakeholders, including industry representatives, in the interest of their patients. Good communication will embrace trust, integrity, honesty and openness. Funding support for NGO activities is difficult to obtain. It very much depends on the organisation raising its own financial resources and relying largely on volunteers to carry out the workload. Credibility, transparency and democracy are the most treasured assets of patient organisations. Every group aims to be in a position to carry out its work based on the support of purely altruistic charitable contributions. However, there are hardly any non-commercial sources prepared to fund patient groups. This poses an ongoing challenge to patient groups: the need to develop a strategy which will balance corporate funding with a maximum from other sources. We owe it to our partners, who have placed their trust in us, to act in a fully democratic, independent and transparent manner, according to the highest standards of good governance. We would like to thank the European Cancer Patient Coalition (ECPC), the European Aids Treatment Group (EATG), the European Organisation for Rare Diseases (EURORDIS) and the International Patient Organisation for Primary Immunodificiencies (IPOPI) for development of this Code. A patient organisation should only accept funds for activities that are consistent with its mission and objectives. Patient organisations that receive funding from any source, including industry or governmental bodies, should at all times remain open, honest and transparent concerning the amounts and sources of such funding. Public documents of patient organisations, e.g. annual reports and websites, should clearly illustrate such information and be fully accessible. For transparency’s sake, funders should also receive public acknowledgement for their support. Acknowledgement should be attributed to the funding person or organisation itself, but not to a specific product or project. Patient organisations should indicate the percentage of the overall income that each funder (individual person, government organisations, industry, etc.) represents. Funds for core activities should always be received on an unconditional basis. To avoid undue reliance on any particular company, such funds should be balanced and diversified as much as possible to avoid conflicts of interest and guarantee independence. Funds or financial support for projects can only be accepted without any conditions imposed on the design and conduct of the project, guaranteeing full independence of the patient organisation. Any ensuing publication will be the property of the patient organisation and findings may not be used or quoted by the funder without the explicit permission of the patient organisation involved. No information in relation to the project should ever be used to promote the use of any specific product or business of the funder. Patient organisations may accept financial support or assistance in kind for their own specific events. Funding should ideally come from more than one source, though it is recognised that this will not always be possible. Financial engagement should not exercise any control over the programme’s content or choice of speakers at patient organisations’ events. Patient organisations should mention the names of the corporate partners supporting their website or electronic materials. Corporate logo size and the space dedicated to the mention of the company on the website should be modest in size to avoid being perceived as an advertisement. If logos need to be displayed, their size should be restricted and fully implement national/European legislation into consideration. Patient organisations should not be funded for activities aimed at promoting the use of any specific product and/or service. They may contribute to the production of material that relates to the management of a specific condition but should make all best efforts to ensure that no specific product or other treatment can be perceived to be recommended by the patient organisation. In this context we refer to the International Codex of Marketing of Breast-Milk Substitutes. All promotional activities related to approved (prescription) medicines are not permitted within the current EU legislation and respective industry codes of ethics. Patient organisations must ensure that none of their activities can possibly be associated with promotional activities. Genuine interaction/cooperation (e.g. satellite symposiums) is encouraged, provided this is in no way promotional. Patient organisations should be mindful of potential conflicts and unintended consequences and ensure that they strictly adhere to their own independent patient-centred agenda. Disseminating unbalanced, non-validated or partial information about a product/service which is produced, marketed or provided by a company, whether it funds your organisation or not. Being quoted in the company’s corporate communication in favour of, or against a product. Participating as speaker/participant in a company event for the launch of a pharmaceutical product (see below 2.4). Participating in an ad hoc meeting sponsored by a single company to inform patients on their products. (see below 2.4). Appearing in promotional materials for a certain product of the company (e.g. booklets about a specific medicine) or to testify as a “consumer” of that medicine. Contact information to patient organisations can be included in a separate section. Patient organisations and their representatives must be alert and refuse to be quoted in industry press releases that relate to a marketed product or a product under development. If a patient organisation feels the need to communicate to the media about a product, it should issue its own press release which is clearly independent of industry. If a company quotes a patient organisation’s opinion or refers to the organisation’s own communication materials (magazines, publications, web site etc.) without the organisation’s written permission, it is important to object to the company by registered letter with a copy to the company’s national industry association. The programme is sponsored by several companies, instead of a single one. Patient organisations/representatives have been involved in the preparatory phase of the training programme. At all times it is preferable to find an equivalent programme run by other NGOs or academic institutions and ask the company to sponsor the patient organisation’s participation. If a patient organisation/representative participates in an industry launch/promotion of a product, no photos must be taken or released without prior authorisation from the person/s involved. For clarity and to avoid future complications, it is recommended to make arrangements in writing before the event. If a patient organisation/representative participates in an ad hoc meeting sponsored by a single company to inform patients about their products, the former should insist that multiple sources of information from independent third parties are involved to ensure that the information is more balanced. Information meetings without independent experts present could be considered as an infringement e.g. of the EU Pharmaceutical Advertising Directive or other adequate legislation. Participation in a meeting or conference organised by the company itself. Participation in a meeting or conference organised by a third party. Reviewing industry materials, leaflets, protocols etc. Consultancy on industry policy, advisory committees etc. This is current practice for health care professionals. Patient organisations should be considered on an equal basis, and therefore can also receive honoraria for similar circumstances. Patient organisations’ internal policies and agreements should be fully transparent. Patient organisations should refrain from contributing to industry web sites. Any health-related information that a patient organisation provides on its own website or in its printed materials should be free from any commercial advertising. This should also be stated in the information. The accuracy of the information should be checked by an advisory board that is independent from the commercial interests of the company. Disease awareness campaigns can be considered as an indirect form of advertising in some EU countries and may therefore be against the legislation. Although such campaigns may benefit some patients or the general public, it is unwise of patient organisations to be associated unless the campaign has the backing of the public health authority. Patient organisations must ensure that any such campaign is not only an industry initiative, but responds to a well characterised public health need, that is agreed and supported by the national and/or European public health authorities. Commercial organisations wishing to mention the name of a patient organisation should seek prior written authorisation from the latter. * The healthcare industry is defined as commercial manufacturers of healthcare products, devices and services, including distributors and wholesalers. EFCNI’s Trustee and Executive Boards meet once per year to monitor EFCNI’s activities and funding. The Chairs of the Executive and Trustee Board Exchange regularly in-between the annual meetings. EFCNI will be transparent about gifts accepted in terms of their sources and purposes. EFCNI will not accept financial donations of any size from an alcohol manufacturer because of the direct link between the use of alcohol and problems in pregnancy and in the newborn. However, if an employee of an alcohol manufacturer, due to personal circumstances wishes to support and donate to EFCNI from personal efforts, this is acceptable to the Trustees. It is felt by the Trustees that many people who have experienced the heartache of losing a baby often would like to support a charity in memory of their baby and to prevent others from having a similar experience. Not accepting their donations on the basis on who they work for would be unacceptable discrimination. This policy does not apply companies such as supermarkets where many products are stocked and are not reliant on just alcohol. We will not accept donations of any size directly from any tobacco company. This decision is made because tobacco plays a key role in problems in pregnancy and undermines our aim to ensure every baby is given the best start in life. However, if an employee of a tobacco company, due to personal circumstances, wishes to support and donate to EFCNI from personal efforts, this is acceptable to the Trustees. It is felt by the Trustees that many people who have experienced the heartache of losing a baby often would like to support a charity in memory of their baby and to prevent others from having a similar experience. Not accepting their donations on the basis on who they work for would be unacceptable discrimination. The Parties will not accept funding or donations of any size directly from any company involved in the production of or trade with arms or with military. This decision is made because this field of industry hampers neutrality and undermines our aim to ensure every baby is given the best start in life. However, if an employee of a company active in the above mentioned industry or trade, due to personal circumstances, wishes to support and donate to the organisation from personal efforts, this is acceptable to the Parties. Many people who have experienced the heartache of losing a baby often would like to support a charity in memory of their baby and to prevent others from having a similar experience. Not accepting their donations on the basis on who they work for would be unacceptable discrimination. The Trustees strongly support that breastfeeding is necessary for the healthy development of babies, that it is crucial for saving preterm and newborn babies lives and influences a child’s development far into the future. Every baby should have access to breast milk. It should be the first choice and should be regarded as best practice. The Trustees also recognize that, in the case of preterm and newborn babies it is not always possible to follow this best practice and help is required in the form of expressed breast milk from the mother or from a donor, the use of fortifiers or the use of specially formulated preterm infant formula which needs to be research save and of high-quality. It is research proven that for very small preterm babies; the milk of their mothers needs fortifiers to ensure a healthy brain development of the baby. Consequently, even existing breast milk from mothers of very preterm babies needs to be supplemented with, what we feel is very important, a research and high-quality proven fortifier. EFCNI is aware of the WHO’s code in relation to marketing of infant formulas and will not enter into initiatives which contravene these. EFCNI accepts financial donations from milk manufacturers. EFCNI will not provide direct endorsement of infant milk products e.g. logo on packaging or promotions which promote infant formula instead of breastfeeding. No infant feeding products or product information will be passed onto any beneficiary of our training grants nor will personal data be passed onto a milk manufacturer. In this matter, we agree with the International Code of Marketing of Breast-milk Substitutes. The Trustees do not believe this industry contravenes with the cause, vision and mission of EFCNI as stated in the statutes. EFCNI accept financial donations from pharmaceutical companies. We will not be aligned to any one company and seek collaborations with all pharmaceutical companies who can play a major role aim at improving maternal and newborn health. No pharmaceutical company will have influence over our decisions. For all financial donations, EFCNI adheres to the Code of Conduct signed by the Trustee and Executive Board and also available on our website.